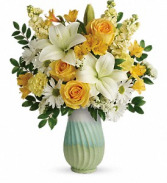 This colorful mix features yellow roses, white asiatic lilies, yellow alstroemeria, light yellow carnations, light yellow stock, white daisy spray chrysanthemums, white sinuata statice, and huckleberry. 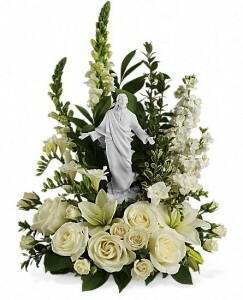 Delivered in an Art of Spring vase. 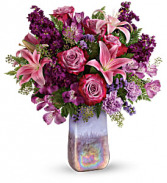 This bouquet features lavender roses, pink asiatic lilies, purple alstroemeria, lavender carnations, lavender sinuata statice, seeded eucalyptus, and leatherleaf fern. Delivered in an Amethyst Gemstone Art Glass vase. 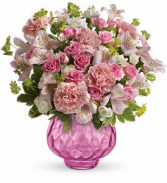 Nothing's prettier than pink - and this bouquet is bursting with it! Delicate roses and alstroemeria look even more delightful in our brilliant gem vase, a gift she can enjoy for years to come as an elegant votive candle holder!